A NURSERY LIKE NO OTHER, Weird Dude's Plant Zoo, L.L.C. now resides on five acres in sunny Southwest Florida. Co-owner Marty Harper and assorted other critters live on the nursery property. Debbie Gartzke, co-owner, remains in Staunton, Virginia, where the nursery began, awaiting the sale of the greenhouse property there, and spends a couple of weeks at a time at the Florida site every few months. In Florida, as they did in Virginia, Marty is surrounding the house and nursery more and more each year with display gardens in full sun to deep shade. We hope that one day these gardens will provide opportunities for visitors to the nursery to experience in the garden the plants which Weird Dude's Plant Zoo offers. MARTY HARPER, aka Weird Dude, co-owner, nursery manager, head grower, gardener, electrician, plumber, carpenter, and janitor, spends his free time going insane about what he's going to do the next day. When Marty is not tending to nursery tasks, he is researching new plants and studying plant health. Marty acquired his first plant at age nine, a Lemaireocereus marginatus, Organ Pipe Cactus, while visiting relatives in California. He has been hooked on plants ever since. After graduating from Washington and Lee University in Lexington, Virginia, with a degree in Geology, Marty worked for the U. S. Forest Service as a geologist, timber marker, mapmaker, and firefighter. Marty then spent time in Florida working for Oglesby Nursery in tissue culture and with other nurseries in the deep South as a grower and salesman. Marty also spent over six years working for nurseries in the Shenandoah Valley of Virginia as a perennial plant grower and salesperson. 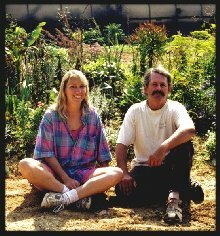 In 1998, after selling their plants at a local Farmer's Market for three years, Marty and co-owner Debbie Gartzke opened Weird Dude's Plant Zoo. Marty now grows all of the plants which Weird Dude's Plant Zoo sells. Marty has personally grown more than 6,000 species of plants from Zone 1 to 11 and has never found a plant he did not like. (However, he has been rather angry at several hundred.) Marty has gained a reputation for knowing more about more species of plants than anyone around. He hs always made it his mission to learn more about root disease and plant health then anyone else around. DEBBIE GARTZKE, aka Weird Dudette, head accountant, paperwork organizer, greenhouse plastic patcher, garden mulcher, Farmer's Market and plant show salesperson, Ryder truck driver, Webmaster, photographer, gardener, Weird Dude's main squeeze, and fulltime lawyer in her spare time, has no free time. Debbie has been growing vegetable and perennial gardens for over 30 years and is an up-and-coming grower in her own right. 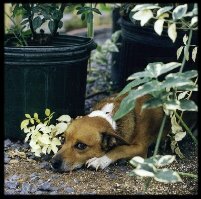 BROWN, our beloved Jack Russell Terrier and head security guard, passed away in October of 2004. While we should probably delete him from this page, his spirit is still with us, keeping us going through drought, flood and freeze. Anyone who has ever been fortunate enough to have a Jack Russell own them will understand. Copyright © 2010 Weird Dude's Plant Zoo, L.L.C. All rights reserved.